Joe and Kathy Winter have been creating art in the Winter Art Studio in their converted carriage house in the Chestnut Hill section of Philadelphia, PA for 30 years. Their commissions include work in bronze, aluminum, terra-cotta, wood, stone and fiberglass, and stained glass. They are both graduates of the University of Pennsylvania and the Pennsylvania Academy of the Fine Arts in Philadelphia. 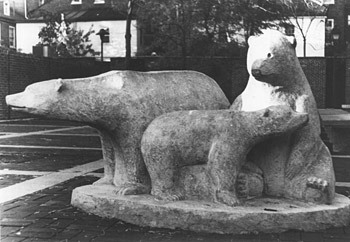 Joe, a sculptor, has done several commissions for the City of Philadelphia, The most well-known may be The Family of Bears in Three Bear Park Delancey St., Phila., PA. He has done many portrait commissions, liturgical sculpture for local churches, and medallic sculpture for the United States Mint and numerous private Mints. Kathy is a painter, specializing in portraiture, but enjoying other subjects; landscapes, flowers, still life in oil, pastel and water color. She designed the stained glass windows for the chapel at Shore Memorial Hospital, Somers Point, NJ.